Today, the President is in Camden to talk about the promising progress that city is making in enhancing community policing. Last December, President Obama launched the Task Force on 21st Century Policing to better understand specific policing challenges and help communities identify actions they can take to improve law enforcement and enhance community engagement. Since that time, we have seen law enforcement agencies around the country working harder than ever to make the promise of community policing real. Many of the Task Force’s recommendations emphasize the opportunity for departments to better use data and technology to build community trust. As a response, the White House has launched the Police Data Initiative, which has mobilized 21 leading jurisdictions across the country to take fast action on concrete deliverables responding to these Task Force recommendations in the area of data and technology. Camden is one such jurisdiction. By finding innovative work already underway in these diverse communities and bringing their leaders together with top technologists, researchers, data scientists and design experts, the Police Data Initiative is helping accelerate progress around data transparency and analysis, toward the goal of increased trust and impact. Through the Initiative, key stakeholders are establishing a community of practice that will allow for knowledge sharing, community-sourced problem solving, and the establishment of documented best practices that can serve as examples for police departments nationwide. Like many police departments, Camden wants to use smarter, more data-driven ways of improving community policing efforts and reducing uses of force. However, challenges with technology systems often get in the way. For instance, the Camden County PD cobbles together 41 systems that have individual value but are not designed to work together, requiring their beat officers to enter the same data multiple times. In this environment, meaningful data analysis ends up being extremely difficult to conduct, requiring analysts to spend more time on extracting the data than on critical analysis. The President’s Police Data Initiative has assembled a volunteer team of technology experts who are also in Camden today. The team will spend two days in Camden on a design sprint, engaging directly with front line officers, detectives, crime analysts and department leadership to help envision what a truly effective technology system could look like. The two-day deployment will help the team consider best practices and address specific technology questions as they arise, enabling departments like Camden to find the solutions that most fit their needs. By upgrading its technology practices, the Camden County PD will have more efficient data supply chains, and will be better positioned to use that data to improve its internal operations and to identify and solve policing problems in a more timely manner. The lessons learned in Camden can help law enforcement around the country both by example and also directly since some of the development work can be shared though open source best practice. The effort has focused on specific actions law enforcement agencies can take to make progress in these two areas. The collaboration has generated multiple commitments to action and the White House is working with agencies and key enabling partners now to drive quick implementation. 1. Use open data to build transparency and increase community trust. All 21 police departments have committed to release a combined total of 101 data sets that have not been released to the public. The types of data include uses of force, police pedestrian and vehicle stops, officer involved shootings and more, helping the communities gain visibility into key information on police/citizen encounters. Code for America and others are helping on this. For information on how Police Departments can jumpstart their open police data efforts, click here. To make police open data easy to find and use, the Police Foundation and ESRI are building a public safety open data portal to serve, in part, as a central clearinghouse option for police open data, making it easily accessible to law enforcement agencies, community groups and researchers. Code for America and CI Technologies will work together to build an open source software tool to make it easier for the 500+ U.S. law enforcement agencies using IA Pro police integrity software to extract and open up data. To make it easier for agencies to share data with the public about policing, Socrata will provide technical assistance to cities and agencies who are working toward increased transparency. 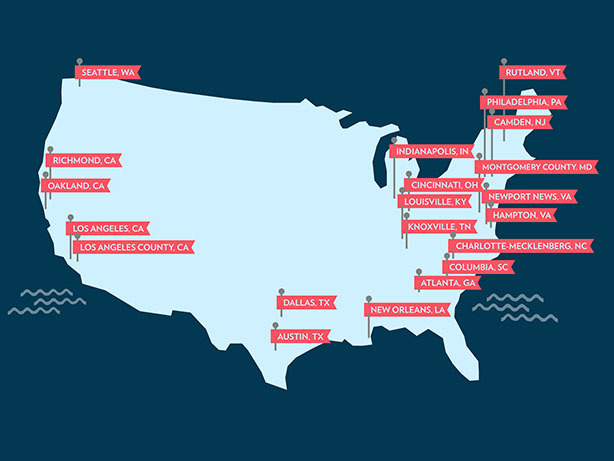 To help this newly released data come alive for communities through mapping, visualizations and other tools, city leaders, non-profit organizations, and private sector partners will host open data hackathons in cities around the country. In New Orleans, Operation Spark, a non-profit organization that teaches at-risk New Orleans youth software development skills, will work with data opened by the New Orleans Police Department at a weeklong code academy. Presidential Innovation Fellows working with the U.S. Chief Technology Officer and Chief Data Scientist will work collaboratively with key stakeholders, such as Code for America and the Sunlight Foundation, to develop and release an Open Data Playbook for police departments that they can use as a reference for open data best practices and case studies. The Charlotte-Mecklenburg Police Department is working with the Southern Coalition for Social Justice to use open data to provide a full picture of key policing activities, including stops, searches and use-of-force trends, information and demographics on neighborhoods patrolled, and more. This partnership will build on a website and tools already developed by the Southern Coalition for Justice which provide visualization and search functions to make this data easily accessible and understandable. The International Association of Chiefs of Police, the Police Foundation, and Code for America have committed to helping grow a community of practice for law enforcement agencies and technologists around open data and transparency in police community interactions. 2. Internal accountability and effective data analysis. While many police departments have systems in place, often called “early warning systems,” to identify officers who may be having challenges in their interactions with the public and link them with training and other assistance, there has been little to no research to determine which indicators are most closely linked to bad outcomes. To tackle this issue, twelve police departments committed to sharing data on police/citizen encounters with data scientists for in-depth data analysis, strengthening the ability of police to intervene early and effectively: Austin, TX; Camden, NJ; Charlotte, NC; Dallas, TX; Indianapolis, IN; Knoxville, TN; LA City; LA County; Louisville, KY; New Orleans, LA; Philadelphia, PA; and Richmond, CA. The University of Chicago will provide a team of five data science fellows from the Eric and Wendy Schmidt Data Science for Social Good program to work with 3-4 police departments over a 14 week engagement, starting in late May, to begin to prototype data analysis tools that will help police departments identify the behaviors most indicative of later problems. The Oakland Police Department, which has deployed body worn cameras for over four years, has partnered with a team of researchers at Stanford University to build automated tools to comb through the audio to surface police/citizen encounters that either went particularly poorly or went particularly well. This will allow the Oakland PD to quickly identify problems and also to lift up real world examples of the great police work that happens every day. The Stanford team is also researching ways that body worn camera data can be used to track and inform the effectiveness of training in the field, using the camera data to see whether the classroom experience translated effectively to encounters on the street. The Department of Justice and the Police Data Initiative stakeholders will work with universities and other research partners to identify opportunities to coordinate body worn camera research to help avoid unintended overlap, maximize the coverage of research topics and increase cross-learning. Additionally, the Police Data Initiative will work with cutting-edge leaders in advanced video analysis to identify opportunities to help police departments maximize the value of the thousands of hours of video body worn cameras will produce. We are excited about the Police Data Initiative as a fast, tangible, collaborative response to recommendations of the Task Force on 21st Century Policing and we are glad that so many cities have stepped forward to work towards better use of data and technology in ways that will build community trust and impact. Megan Smith is the United States Chief Technology Officer (CTO) in the Office of Science and Technology Policy. Roy L. Austin, Jr. is Deputy Assistant to the President for Urban Affairs, Justice and Opportunity in the Domestic Policy Council.